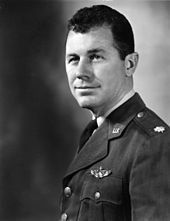 Charles Elwood “Chuck” Yeager (/ˈjeɪɡər/; born February 13, 1923) is a retired brigadier general in the United States Air Force and record-setting test pilot. In 1947, he became the first pilot confirmed to have exceeded thespeed of sound in level flight. Yeager’s career began in World War II as a private in the United States Army Air Forces. After serving as an aircraft mechanic, in September 1942 he entered enlisted pilot training and upon graduation was promoted to the rank of flight officer (the World War II USAAF equivalent to warrant officer) and became a P-51 fighter pilot. After the war, Yeager became a test pilot of many types of aircraft, including experimental rocket-powered aircraft. As the first human to officially break the sound barrier, on October 14, 1947, he flew the experimentalBell X-1 at Mach 1 at an altitude of 45,000 ft (13,700 m). Although Scott Crossfield was the first to fly faster than Mach 2 in 1953, Yeager shortly thereafter set a new record of Mach 2.44. Yeager later commanded fighter squadrons and wings in Germany, and in Southeast Asia during the Vietnam War, and in recognition of the outstanding performance ratings of those units he was promoted to brigadier general. Yeager’s flying career spans more than 60 years and has taken him to every corner of the globe, including the Soviet Union during the height of the Cold War. Yeager was born February 13, 1923, to farming parents Susie Mae and Albert Hal Yeager in Myra, West Virginia, and graduated from high school in Hamlin, West Virginia, in June 1941. He had two brothers, Roy andHal, Jr., and two sisters, Doris Ann (accidentally killed at age 2 by 6-year-old Roy playing with a shotgun)and Pansy Lee. His first experience with the military was as a teen at the Citizens Military Training Camp at Fort Benjamin Harrison, Indianapolis, Indiana, during the summers of 1939 and 1940. On February 26, 1945, Yeager married Glennis Dickhouse, and the couple had four children. Glennis died in 1990. Yeager enlisted as a private in the U.S. Army Air Forces (USAAF) on September 12, 1941, and became an aircraft mechanic at George Air Force Base, Victorville, California. At enlistment, Yeager was not eligible for flight training because of his age and educational background, but the entry of the U.S. into World War II less than three months later prompted the USAAF to alter its recruiting standards. Having unusually sharp vision (a visual acuity rated 20/10), which once enabled him to shoot a deer at 600 yards (550 m), Yeager displayed natural talent as a pilot and was accepted for flight training. He received his wings and a promotion to flight officer at Luke Field, Arizona, where he graduated from class 43C on March 10, 1943. Assigned to the 357th Fighter Group at Tonopah, Nevada, he initially trained as a fighter pilot, flying Bell P-39 Airacobras (earning a seven-day grounding order for pruning a tree belonging to a local farmer during a training flight), and shipped overseas with the group on November 23, 1943. P-51D-20NA, Glamorous Glen III, is the aircraft in which Yeager achieved most of his aerial victories. Stationed in the United Kingdom at RAF Leiston, Yeager flew P-51 Mustangs in combat with the 363d Fighter Squadron. 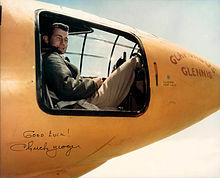 He named his aircraft Glamorous Glen after his girlfriend, Glennis Faye Dickhouse, who became his wife in February 1945. Yeager had gained one victory before he was shot down over France in his 1st aircraft (P-51B-5-NA s/n 43-6763) onMarch 5, 1944 during his eighth mission. He escaped to Spain on March 30 with the help of the Maquis (French Resistance) and returned to England on May 15, 1944. During his stay with the Maquis, Yeager assisted the guerrillas in duties that did not involve direct combat, although he did help to construct bombs for the group, a skill that he had learned from his father. He was awarded the Bronze Star for helping another airman, who had lost part of his leg during the escape attempt, to cross the Pyrenees. Despite a regulation prohibiting “evaders” (escaped pilots) from flying over enemy territory again, the purpose of which was to prevent a second capture from compromising resistance groups, Yeager was reinstated to flying combat. He had joined another evader, bomber pilot Captain Fred Glover, in speaking directly to the Supreme Allied Commander, General Dwight D. Eisenhower, on June 12, 1944. With Glover pleading their case, they argued that because the Allies had invaded France and the Maquis were by then openly fighting the Nazis alongside Allied troops, if Yeager or Glover were shot down again, there was little about those who had previously helped them evade capture that could be revealed to the enemy. Yeager demonstrated outstanding flying skills and combat leadership. On October 12, 1944, he became the first pilot in his group to make “ace in a day,” downing five enemy aircraft in a single mission. Two of these kills were scored without firing a single shot: when he flew into firing position against a Messerschmitt Bf 109, the pilot of the aircraft panicked, breaking to starboard and colliding with his wingman. Yeager later reported both pilots bailed out. He finished the war with 11.5 official victories, including one of the first air-to-air victories over a jet fighter (a German Messerschmitt Me 262). Yeager was commissioned a second lieutenant while at Leiston, and was promoted to captain before the end of his tour. He flew his 61st and final mission onJanuary 15, 1945, and returned to the United States in early February. As an evader, he received his choice of assignments and, because his new wife was pregnant, chose Wright Field to be near his home in West Virginia. His high number of flight hours and maintenance experience qualified him to become a functional test pilot of repaired aircraft, which brought him under the command of Colonel Albert Boyd, head of the Aeronautical Systems Flight Test Division. 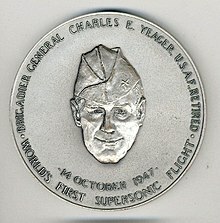 Chuck Yeager broke the sound barrier on October 14, 1947, in the X-1. Yeager remained in the Air Force after the war, becoming a test pilot at Muroc Army Air Field (now Edwards Air Force Base). After Bell Aircraft test pilot “Slick” Goodlin demanded $150,000 ($1.6 million in 2015 dollars) to break the sound “barrier,” the USAAF selected Yeager to fly the rocket-powered Bell XS-1 in a NACA program to research high-speed flight. Yeager in front of the Bell X-1, which, as with all of the aircraft assigned to him, he named Glamorous Glennis (or some variation thereof), after his wife. Such was the difficulty in this task that the answer to many of the inherent challenges were along the lines of “Yeager better have paid-up insurance.” Two nights before the scheduled date for the flight, Yeager broke two ribs when he fell from a horse. He was worried that the injury would remove him from the mission and reported that he went to a civilian doctor in nearby Rosamond, who taped his ribs. [Note 2] Yeager told only his wife, as well as friend and fellow project pilot Jack Ridley, about the accident. On the day of the flight, Yeager was in such pain that he could not seal the X-1’s hatch by himself. Ridley rigged up a device, using the end of a broom handle as an extra lever, to allow Yeager to seal the hatch. Yeager broke the sound barrier on October 14, 1947, flying the X-1 at Mach 1.07 at an altitude of 45,000 ft(13,700 m). [Note 3] over the Rogers Dry Lake in the Mojave Desert. Yeager was awarded the MacKay and Collier Trophies in 1948 for his mach-transcending flight, and the Harmon International Trophy in 1954. The X-1 he flew that day was later put on permanent display at the Smithsonian Institution‘s National Air and Space Museum. Yeager went on to break many other speed and altitude records. He was also one of the first American pilots to fly a MiG-15, after its pilot, No Kum-sok, defected to South Korea. Returning to Muroc, during the latter half of 1953, Yeager was involved with the USAF team that was working on the X-1A, an aircraft designed to surpass Mach 2 in level flight. That year, he flew a chase aircraft for the civilian pilot Jackie Cochran, a close friend, as she became the first woman to fly faster than sound. The Ridley/Yeager USAF team achieved Mach 2.44 on December 12, 1953. Shortly after reaching Mach 2.44, Yeager experienced a loss of aerodynamic control of the X-1A due to inertia coupling at approximately 80,000 ft (24,000 m). With the aircraft simultaneously rolling, pitching, and yawing out of the sky, Yeager dropped 51,000 feet (16,000 m) in 51 seconds before regaining control of the aircraft at approximately 29,000 feet (8,800 m). He was able to land the aircraft without further incident. Yeager was awarded the Distinguished Service Medal (DSM) in 1954 for this achievement. Yeager received the DSM in the Army design as the Air Force Distinguished Service Medal was not awarded until 1965. Yeager was foremost a fighter pilot and held several squadron and wing commands. From May 1955 to July 1957 he commanded the F-86H Sabre-equipped 417th Fighter-Bomber Squadron (50th Fighter-Bomber Wing) at Hahn AB,Germany, and Toul-Rosieres Air Base, France; and from 1957 to 1960 the F-100D Super Sabre-equipped 1st Fighter Day Squadron (later, while still under Yeager’s command, re-designated the 306th Tactical Fighter Squadron) at George Air Force Base, California, and Morón Air Base, Spain. Now a full colonel in 1962, after completion of a year’s studies at the Air War College, Yeager became the first commandant of theUSAF Aerospace Research Pilot School, which produced astronauts for NASA and the USAF, after its redesignation from the USAF Flight Test Pilot School. (Yeager himself had only a high school education, so was not eligible to become an astronaut like those he trained.) Between December 1963 and January 1964, Yeager completed five flights in the NASA M2-F1 lifting body. An accident during a test flight in one of the school’s NF-104s put an end to his record attempts. In 1966 Yeager took command of the 405th Tactical Fighter Wing at Clark Air Base, the Philippines, whose squadrons were deployed on rotational temporary duty (TDY) in South Vietnam and elsewhere in Southeast Asia. There he accrued another 414 hours of combat time in 127 missions, mostly in a Martin B-57 Canberra light bomber. In February 1968, Yeager was assigned command of the 4th Tactical Fighter Wing at Seymour Johnson Air Force Base, North Carolina, and led the McDonnell Douglas F-4 Phantom IIwing in South Korea during the Pueblo crisis. On June 22, 1969, Yeager was promoted to brigadier general, and was assigned in July as the vice-commander of the Seventeenth Air Force. From 1971 to 1973, at the behest of Ambassador Joe Farland, Yeager was assigned to Pakistan to advise the Pakistan Air Force. Yeager made a cameo appearance in the movie The Right Stuff (1983). He played “Fred,” a bartender at “Pancho’s Place”, which was most appropriate, as Yeager said, “if all the hours were ever totaled, I reckon I spent more time at her place than in a cockpit over those years.” His own role in the movie was played by Sam Shepard. For several years in the 1980s, Yeager was connected to General Motors, serving as the public face of AC Delco, the company’s automotive parts division. In 1986 he was invited to drive the Chevrolet Corvette pace car for the 70th running of the Indianapolis 500. In 1988, Yeager was again invited to drive the pace car, this time at the wheel of an Oldsmobile Cutlass Supreme. In 1986, President Reagan appointed Yeager to the Rogers Commission that investigated the explosion of the Space Shuttle Challenger. In the late 1980s and early 1990s, Yeager set a number of light general aircraft performance records for speed, range, and endurance. Most notable were flights conducted on behalf of Piper Aircraft. On one such flight, Yeager performed an emergency landing as a result of fuel exhaustion. On another, he piloted Piper’s turboprop Cheyenne 400LS to a time-to-height record: FL350 (35,000 feet) in 16 minutes, exceeding the climb performance of a Boeing 737 at gross weight. Yeager is fully retired from military test flying, after having maintained that status for three decades after his official retirement from the Air Force. On October 14, 1997, on the 50th anniversary of his historic flight past Mach 1, he flew a new Glamorous Glennis III, an F-15D Eagle, past Mach 1. The chase plane for the flight was an F-16 Fighting Falcon piloted by Bob Hoover, a legendary air-show pilot who had been Yeager’s wingman for the first supersonic flight. This was Yeager’s last official flight with the U.S. Air Force. At the end of his speech to the crowd, Yeager concluded, “All that I am … I owe to the Air Force.” Later that month, he was the recipient of the Tony Jannus Award for his achievements. On October 14, 2012, on the 65th anniversary of breaking the sound barrier, Yeager did it again at the age of 89, riding in a McDonnell Douglas F-15 Eagle piloted by Captain David Vincent out of Nellis Air Force Base. Yeager, who never attended college and was often modest about his background, is considered by many,[who?] including Flying Magazine, The California Hall of Fame, the State of West Virginia, National Aviation Hall of Fame, a few U.S. presidents, and the United States Army Air Force, to be one of the greatest pilots of all time. Despite his lack of higher education, he has been honored in his home state. Marshall University has named its highest academic scholarship, theSociety of Yeager Scholars, in his honor. Yeager was also the chairman of Experimental Aircraft Association‘s Young Eagle Program since 1994, and has been named the program’s chairman emeritus. Yeager Airport in Charleston, West Virginia, is named in his honor. The Interstate 64/Interstate 77 bridge over the Kanawha River in Charleston is named in his honor. On October 19, 2006, the state of West Virginia also honored Yeager with a marker along Corridor G (part of U.S. 119) in his home Lincoln County, and also renamed part of the highway the Yeager Highway. Yeager is an honorary board member of the humanitarian organization Wings of Hope. On August 25, 2009, Governor Schwarzenegger and Maria Shriverannounced that Yeager would be one of 13 California Hall of Fame inductees in The California Museum‘s yearlong exhibit. The induction ceremony was onDecember 1, 2009, in Sacramento, California. Flying Magazine ranked Yeager number 5 on its 2013 list of The 51 Heroes of Aviation; he is the highest-ranked living person on the list. The Civil Air Patrol, the volunteer auxiliary of the USAF, awards the Charles E. “Chuck” Yeager Award to its Senior Members as part of its Aerospace Education program. 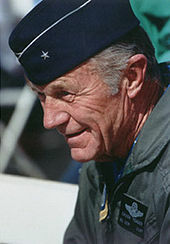 The General Chuck Yeager Cadet Squadron (SER-FL-237), associated with the Florida Wing, Civil Air Patrol, and based in Brandon, Florida, is also named in his honor. 1976 Congressional Silver Medal for breaking the sound barrier for the first time. 1976 Collier Trophy and Mackay Trophy, for breaking the sound barrier for the first time. Yeager and Glennis moved to Grass Valley, California, after his retirement from the Air Force in 1975. The couple prospered because of Yeager’s best-selling autobiography, speaking engagements and commercial ventures. Glennis Yeager died of ovarian cancer in 1990. They had four children (Susan, Don, Mickey and Sharon). In 2000, Yeager met actress Victoria Scott D’Angelo on a hiking trail in Nevada County. The pair started dating shortly thereafter, and married in August 2003.Subsequent to the commencement of their relationship, a bitter dispute arose between Yeager, his children and D’Angelo. The children contended that D’Angelo, 41 years Yeager’s junior, had married him for his fortune. Yeager and D’Angelo both denied the charge. Litigation ensued, in which his children accused D’Angelo of “undue influence” on Yeager, and Yeager accused his children of diverting hundreds of thousands of dollars from his pension fund. In August 2008, theCalifornia Court of Appeal ruled for Yeager, finding that his daughter Susan had breached her duty as trustee. Jump up^ Chuck Yeager is not related to Jeana Yeager, one of the two pilots of the Rutan Voyager aircraft, which circled the world without landing or refueling. Jump up^ In some versions of the story, the doctor was a veterinarian; however, local residents have noted that Rosamond was so small that it had neither a medical doctor nor a veterinarian. Jump up^ There is anecdotal evidence that American pilot George Welch may have broken the sound barrier two weeks before Yeager, while diving an XP-86 Sabre on October 1, 1947, and again on October 14, just 30 minutes before Yeager’s X-1 flight. However, the precision instruments used to carefully document the speed of Yeager’s flight were not used during Welch’s flights. There was also a disputed claim by German pilot Hans Guido Mutke that he was the first person to break the sound barrier, on April 9, 1945, in a Me 262. Jump up^ For his consultant work to the Test Pilot School Commander at Edwards Air Force Base, Yeager was paid one dollar annually, along with all the flying time he wanted. The $1 allowed him to be covered by workers’ compensation insurance. Jump up^ This is apparently a unique award, as the law that created it states it is equivalent to a noncombat Medal of Honor. It is referred to as a Special Congressional Silver Medal in the President’s Daily Diary (also see for a list of ceremony attendees). ^ Jump up to:a b c d Yeager and Janos 1985, p. 252. Jump up^ Yeager and Janos 1985, p. 6. Jump up^ Houvouras, John H. “The Man.” The Huntington Quarterly, Winter 1998, p. 21. Retrieved: April 14, 2015. Jump up^ Kantowski, Ron (April 6, 2006). “Q+A Steve Yeager”. Las Vegas Sun. RetrievedFebruary 26, 2016. He’s not my uncle, he’s a cousin. That’s a misprint. You can’t believe everything you read. Jump up^ “Jeana Yeager Was Not Just Along for the Ride”. Los Angeles Times. December 24, 1986. Retrieved February 26, 2016. Jump up^ Yeager and Janos 1985, p. 297. Jump up^ Take Off magazine, Issue 36, p. 991. Jump up^ “Chuck Yeager downs five – becomes an “Ace in a Day””. World War II Today. n.d. Archived from the original on January 21, 2015. Retrieved July 7, 2015. Jump up^ “12 October 1944”. This Day in Aviation. n.d. Archived from the original on July 7, 2015. Retrieved July 7, 2015. Jump up^ “Escape and Evasion Case File for Flight Officer Charles (Chuck) E. Yeager.”narademo.umiacs.umd.edu. Retrieved: December 8, 2010. ^ Jump up to:a b Yeager and Janos 1985, p. 45. ^ Jump up to:a b Samuel 2004, p. 454. ^ Jump up to:a b Coady 2008, p. 13. Jump up^ Yeager and Janos 1985, pp. 63, 80. Jump up^ Yeager and Janos 1985, p. 60. Jump up^ Yeager and Janos 1985, p. 121. Jump up^ Wolfe 1979, pp. 52–53. Jump up^ Yeager and Janos 1985, p. 157. ^ Jump up to:a b Ryan, Craig (August 17, 2015). Sonic Wind: The Story of John Paul Stapp and How a Renegade Doctor Became the Fastest Man on Earth. W. W. Norton & Company. pp. 98–99. ISBN 9781631490798. Retrieved February 26, 2016. Jump up^ Blackburn, Al. “Mach match: Did an XP-86 beat Yeager to the punch?”Smithsonian Air & Space Magazine, January 1999. Retrieved: April 14, 2015. Jump up^ Yoon, Joe. “Me 262 & the Sound Barrier.” aerospaceweb, October 7, 2004. Retrieved: April 14, 2015. Jump up^ Clark 1954, p. 208. Jump up^ Kum-Suk and Osterholm 2007, p. 158. Jump up^ “The Crash of Chuck Yeager’s NF-104A”. check-six.com, December 10, 1963. Jump up^ Yeager and Janos 1985, p. 391. Jump up^ Yeager and Janos 1985, p. 172. Jump up^ Yeager and Janos 1985, p. 418. Jump up^ “Brigadier General Charles E. Yeager.” The 456th Fighter Interceptor Squadron. Retrieved: December 8, 2010. Jump up^ Rogers, Keith. “Famous pilot Yeager re-enacting right stuff 65 years later.” Las Vegas Review-Journal, October 12, 2012. Jump up^ “Public Law 94-179.” United States Statutes. Retrieved: September 10, 2012. Jump up^ “The Daily Diary of President Gerald R. Ford.” fordlibrarymuseum.gov.Retrieved: September 10, 2012. Jump up^ Ford, Harrison. “Freedom and Responsibility”. Sport Aviation, September 2010. Jump up^ “Yeager Comes Home.” WOWK-TV, August 19, 2006. Jump up^ “Chuck Yeager.” Wings of Hope. Retrieved: December 8, 2010. Jump up^ “Chuck Yeager.” Flying Magazine’s 51 Heroes of Aviation, August 19, 2013. Retrieved: April 14, 2015. Jump up^ “Yeager Award – Civil Air Patrol.” Members.gocivilairpatrol.com. Retrieved: July 10, 2014. Jump up^ Yeager and Janos 1985, p. 73. Jump up^ Yeager and Janos 1985, p. 76. Jump up^ Yeager and Janos 1985, pp. 413–414. Jump up^ Moller, Dave. “Yeager children sue their father.” The Union (Nevada County, California), February 19, 2004. Retrieved: September 26, 2011. ^ Jump up to:a b Tresniowski, Alex. “The Wife Stuff – Feuds, Trials & Lawsuits, Bills, Bills, Bills, Chuck Yeager.” People, March 8, 2004. Retrieved: September 26, 2011. ^ Jump up to:a b Hubler, Shawn. “Far from heavens.” Los Angeles Times, July 2, 2004. Retrieved: September 26, 2011. Jump up^ “Record-Setting Pilot Chuck Yeager Sues His Children.” The New York Times, June 7, 2006. Jump up^ “C.A. rules against Chuck Yeager’s daughter in dispute with stepmother.”MetNews, August 26, 2008. Retrieved: November 30, 2012. Jump up^ Yeager v. D’Angelo, no. C052483 (Cal.App.3rd, Aug. 22, 2008). Jump up^ “Mission Statement.” Chuck Yeager Foundation via Engineer’s Council of San Fernando Valley, California. Retrieved: November 18, 2011. Clark, Mark. From the Danube to the Yalu. New York: Harper, 1954. Coady, C. A. J. Morality and Political Violence. Cambridge, UK: Cambridge University Press, 2008. ISBN 978-0-521-70548-6. Hallion, Richard P. Designers and Test Pilots. New York: Time-Life Books, 1982. ISBN 0-8094-3316-8. Kum-Suk, No and J. Roger Osterholm. A MiG-15 to Freedom: Memoir of the Wartime North Korean Defector who First Delivered the Secret Fighter Jet to the Americans in 1953.Jefferson, North Carolina: McFarland & Co., 2007, First edition 1996. ISBN 0-7864-0210-5. Pisano, Dominick A., R. Robert van der Linden and Frank H. Winter. Chuck Yeager and the Bell X-1: Breaking the Sound Barrier. Washington, D.C.: Smithsonian National Air and Space Museum (in association with Abrams, New York), 2006. ISBN 0-8109-5535-0. Samuel, Wolfgang, W.E. American Raiders: The Race to Capture the Luftwaffe’s Secrets. Jackson, Mississippi: University Press of Mississippi, 2004. ISBN 978-1-57806-649-0. Wolfe, Tom. The Right Stuff. New York: Farrar-Straus-Giroux, 1979. ISBN 0-374-25033-2. Yeager, Chuck, Bob Cardenas, Bob Hoover, Jack Russell and James Young. The Quest for Mach One: A First-Person Account of Breaking the Sound Barrier. New York: Penguin Studio, 1997. ISBN 0-670-87460-4. Yeager, Chuck and Charles Leerhsen. Press on! Further Adventures in the Good Life. New York: Bantam Books, 1988. ISBN 0-553-05333-7. Charles E. (Chuck) Yeager on the NASA web site. Did an XP-86 beat Yeager to the punch? This page was last modified on 3 June 2016, at 03:16.